I've decided that developing my own blog system (this site for example) further is not worth the effort, especially since when I originally used an off-the-shelf one (WordPress) my pages appeared much higher up the Google results! (1st or 2nd page, not page 25 or something like that!) - and that by the way was with exactly the same actual text content, at least originally. It never made complete sense to post on killersudoku.org.uk when talking about more than just Killer Sudoku, so I've decided to combine this update with a much-needed overall of the slight embarrassment that was garethmoore.co.uk - so just pop over to garethmoore.co.uk and you can start reading my new puzzle blog! There probably won't be any further updates to this particular blog. 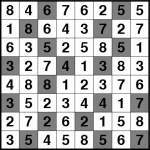 I've started the ball rolling with a combination 9x9 and 6x6 Samurai Sudoku puzzle, so check it out! This week I thought it would be fun to make some new Sudoku using 8-way symmetry. I thought I'd start off with a special 13-grid puzzle where you can really see all the reflections. The effect of the 8-way symmetry is that every one of the 13 sub-grids has at least 2-way symmetry even when considered on its own. 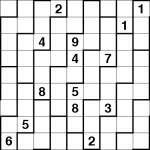 Important: This 'Complete Samurai' puzzle is not like standard Samurai puzzles - in this one in addition to the rows and columns of the 13 grids, every single run of 9 digits in a row or column from one bold line to another must contain 1 to 9. So for example if you count 4 squares right and 7 squares down from the top-left of the puzzle, then you must place 1 to 9 into that row of 9 squares running right from that point - and so on throughout the entire puzzle. Good luck! Quite a while since I added a new puzzle here, so since I have a spare jigsaw sudoku sitting around I thought I'd upload it here. :) Have fun! Last night I added 100 Toroidal and 100 Jigsaw Sudoku puzzles to puzzlemix.com - and someone has already added both of them to their account, which is great! They slowly increase in difficulty, and for the jigsaw there are a range of different region designs. I do have some new code that lets you optionally hide the side panel in the player too, but I decided not to make that live until I have made it pop out again when you complete the puzzle - otherwise I suspect people will stop ranking and commenting on puzzles so often! Which is also a similar reason as to why comments are disabled on killersudoku.org.uk (i.e. here!) at the moment - sorry about that. I will post when I re-enable them, with better spam protection! You can now play Jigsaw Killer Sudoku in my latest interactive puzzle player over at www.puzzlemix.com! I've been making lots of new puzzles and will fairly soon be adding lots of regular Hitori, Slitherlink and Jigsaw Killer to the daily puzzles section, as well as occasional Giant Slitherlink. I will also add lots of specialist puzzle books full of static sets of puzzles of your choice, so if you just want difficult Jigsaw Killer puzzles then you can get just those. But the best value will always be the daily puzzles section, with over 1,000 puzzles in each subscription! I've added a couple of special Christmas puzzles to puzzlemix - Happy Christmas! There's now a Slitherlink player on puzzlemix, adding yet another new type of puzzle to the site! There are also now more puzzle samples in the non-interactive part of the site, which I intend to revamp separately when I have the time. There are now Hanjie puzzles on puzzlemix - at last! I've been working on this for a while. I have added lots of puzzles to appear once a month in the free section, plus another 52 puzzles to appear once a week in the daily puzzles section (obviously I'll add more once the year is up! ), and I have 100 more puzzles ready which tomorrow (or very soon) I will add to a separate 'book' subscription for online play. PS Sorry commenting here on killersudoku.org.uk is disabled - I was getting a lot of disgusting spam here and I need to take the time to add in a working spam-rejection system. I put up lots of new stuff on puzzlemix.com over the weekend. The really big news is new puzzles! This update adds Hanjie, Hitori and Killer Sudoku to the site. There has been a preview of the Killer Sudoku player on the homepage of the site for a while now, but the Hanjie and Hitori players are brand new and I'm really pleased with them. As of Monday I also added highlighting to the current row and column in the Hanjie player, which makes it much easier to use with bigger puzzles. There are various changes to the players, including keyboard shortcuts for undo and redo (Z and X) which are very useful. You also now get the chance to rate a puzzle when you 'give up' on it, which should stop the ratings being biased to those who can actually finish a puzzle! There is now a much improved puzzle listing system which lets you filter and sort the display in all sorts of ways, as well as limit the number of puzzles that are shown either per page or in total to a time period and quantity of your choice. It also shows you more information about how many people have managed to solve each puzzle. The site also finally has detailed instructions on how to play each puzzle, so if you're not familiar with these types then now you can be - and there are also full instructions on how each player works, if you want to take full advantage of all the advanced features. Lots of very minor issues are fixed in the update too - for example if you double-click a number to place it in Apple's Safari browser you would previousl select the whole puzzle; this doesn't matter but it looks ugly. This is fixed in the new update. There are about 20 minor fixes too, such as stopping the 'Check solution' button flashing when you 'undo' from a full grid until you next hit a number key. You'd probably never notice these things, but they're fixed anyway. There's a great change in the helper for Kakuro and Killer Sudoku - now you will find that the 'show current clue fits' option will cross out eliminated fits for you, thus making it much easier to see what possible fits are left. It no longer shrinks the list if you have 'dynamic clues' turned on, since with this change this is no longer helpful. The Hitori player has a feature I promised a long time ago elsewhere - to auto-highlight squares that need to be shaded since they have already been placed as 'definitely clear' elsewhere in a row or column. It's quite fun just to hold down the mouse button and run your pointer round the puzzle watching them flashing on and off as squares shade and unshade again... or maybe that's just me! That's just a selection - you might spot more changes as you use the updated puzzlemix! Now there's one thing remaining in the immediate future - I need to add the puzzles to the puzzle subscriptions, so you can actually play Hitori, Hanjie and Killer Sudoku outside of the samples on the home page! 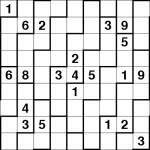 On the basis that something is better than nothing, here's a Samurai Sudoku puzzle to (maybe!) get the ball rolling again! Also keep a look out for the new design Sudoku Pro that will be in the shops in under 2 weeks - it now has an extra colour throughout, and is physically quite a bit bigger and is on much nicer paper. I'm looking forward to getting my copy! Sounds like you\'ve been on a fantastic trip. Good to see a new puzzle on the site. Really enjoyed getting to grips with the samurai above. Also looking forward to the new look Sudoku Pro mag. After a year away (apart from a couple of weeks at Christmas) I am now back in Britain. I am very busy at the moment with various projects but there should be some updates some point in the next month or so! If you have any requests, please let me know. Sorry for the lack of recent puzzle posts - I've been off travelling up in tropical parts of Australia. It was supposed to be hot up there, but just a couple of days ago in the Whitsundays it was the coldest June day since records began, so that was a well timed trip! It rained a lot. Anyway, off even further north in a couple of days again for another couple of weeks, so I'm afraid there won't be many puzzles here for a while. But the good news is that I've worked on and off on puzzlemix.com content and I now have a nearly-complete Hitori player, which will also support Nurikabe with a little tweaking and then be, I think, a good stepping stone to a Hanjie player. I also still need to add some killer sudoku to the database so they show up in user puzzle subscriptions, but that's pretty easy since I have the puzzles all ready - I might also put in some Killer X and Killer Jigsaw if I have time. I've also updated the Kakuro and Killer solving assistant so that it crosses out the number fits that are no longer useful - this is one less thing you might want real pencil and paper for when solving the puzzle, so I think this is really useful. I've stopped it shortening the number fits when you turn on 'dynamic clues' too, since this was hard (confusing) to combine with the new crossing-out feature. This change isn't live on the site yet but I really hope to get time to make this live before I go away again on Thursday. The next Sudoku Pro is almost ready too, with Fillomino as puzzle of the month - that will be the issue after next from the current one. I had good fun making the Fillomino, which I'd never tried before, and I hope there's a good difficulty level progression. You'll have to wait for the magazine to find out though! You can now play Killer Sudoku on puzzlemix.com - currently just from the front page samples, but I'll be adding puzzles to the weekly and daily puzzles soon! Check it out and let me know if you have any comments! Today I fixed the ragged right and bottom puzzle edges that the new Jigsaw and Toroidal puzzles had in Firefox or indeed any standards-compliant non-Internet Explorer browser, and also (I think!) finally got rid of the annoying 'auto-completion' popup that Firefox sometimes shows when entering numbers in the grid. It does this because I steal the input focus to a hidden textbox in order to prevent the backspace key sending you to the previous page (it's the shortcut for 'back' in most browsers). I do this in the first place because this turned out to be the most cross-compatible way of doing it (worked in IE, Firefox, Opera and Safari that is!). It also helps keep the tab key from tabbing into the URL bar in some browsers if you use that to move from square to square. Anyway, I've changed the type of text field so now it shouldn't offer these pop-up number lists. I also noticed that the overall ratings column was missing from the comments pages, so that's now been added in. And (finally) the toroidal player now says Toroidal at the top not Jigsaw (oops). If you haven't tried out the new players then pop over to puzzlemix and give them a go - I'm really interested in any feedback! I've also attached a new Nurikabe puzzle - this one is hard, so beware! Well, the new toroidal and jigsaw players are now up on the puzzlemix.com site, with samples on both the front page and also in the weekly puzzles section for a year from today. However there's only one of each in the weekly section - if you want regular new ones you need to subscribe to the daily puzzles. Every Saturday and Wednesday a new toroidal or jigsaw (alternating) will appear in the daily puzzles section, in addition to the existing two daily puzzles (so not instead of). I've also added the ability to comment on a puzzle directly to the completion dialogue, so now you can write a quick comment without any hassle thanks to some nifty dynamic CSS changes and an AJAX POST to connect to the database. I'm really pleased with how it came out because I didn't want to make the dialogue box too complicated. Even the 'Save comment' button only appears if you type something, and it goes away again once you have. It waits for confirmation that the comment has been saved correctly first, of course. I did some work on an improved rankings page before (the site actually keeps track of exactly how many times you use each of the solving assistants, which I want to allow users to filter by), which I will hopefully get online sometime soon. But now I think that's enough for today - it's 1:45am here in Sydney! I also added support for Sudoku X regions in any of the puzzle types, which it now renders as a fine mesh overlaid on the background colours (rather than changing the colour of the square) - this means I can put up Toroidal X, Jigsaw X and so on without needing any new code next time round. It does mean that existing Sudoku X puzzles display slightly differently, but I bet noone notices unless they're on a very low-resolution display! The only other major thing I mean to add to the Sudoku player now is support for Killer Sudoku - as I've also said previously, the Kakuro code I already have supports Killer Sudoku (it's all one player with internal switches for different types of puzzle) so it's a relatively straightforward case of adding the display of the region totals to the layout and then plugging these into the player code. 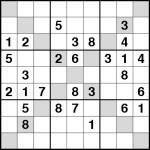 Then you'll be able to play Killer Sudoku with all the advanced solving tools available in the Kakuro player - dynamic clue recalculation, lists of number combination fits and so on. And Killer X and even Killer Jigsaw. The player already supports Sudoku puzzle sizes other than 9x9, as the Futoshiki 5x5, 6x6, 7x7 and 8x8 puzzles demonstrate. I might add some 6x6 Sudoku and variants to puzzlemix at some point too. Finally, mentioning Futoshiki reminds me - it already supports Inequality Sudoku, because this is basically what Futoshiki is without the box regions, so I should add some of those to the site too. But one thing at a time, I think! I thought it would be fun to post some puzzles I've just made with my new Nurikabe editor, so I've attached two puzzles. Both are definitely on the tricky side, so if you've not tried Nurikabe before these probably aren't the best place to start! The larger 15x15 one starts off okay but the final part (the bottom) involves quite a few deductions about what must go where. The 8x8 is surprisingly tricky for its size and maximum clue value, although maybe you'll find it easier than I did! The rules are pretty straightforward: shade in squares so that each number remains in a white 'island' of the specified number of touching squares. Each white island cannot touch any other island, and all the shaded squares must make up one single continuous area. You also are not allowed to form any 2x2 or larger blocks of black squares - this is an important restriction without which these puzzles would have many different answers. Squares are considered to touch if they are adjacent horizontally or vertically. Solving the puzzle mainly stems from working out which squares must be black in order to avoid the shaded squares being split into separate regions, as well as how the white regions must progress in order not to touch any other white island. Good luck! If you want a clue: "End of the line". Now I'm up to the giddy ranks of page 7 of google's results for "Killer Sudoku" (whoo!) it might be time to have a couple of actual Killer Sudoku puzzles too! To make up for not posting any puzzles for a week (see previous post), here is a mix of 4 different Sudoku types! I haven't posted any puzzles for a week. This is mainly because the past week was when I finished off the next issue of Sudoku Pro (puzzle of the month is Nurikabe), but I've also been working hard on some Nurikabe code. I don't want to generate the puzzles automatically (I've not yet seen properly satisfying automatic Nurikabe), but what I do want is a solving assistant which can help validate puzzles rapidly - and that's what I now have. My solver can currently solve almost every puzzle I've found, and what's more it does it in small incremental steps using a variety of human methods so it can rate it accurately by difficulty. Like with most puzzles it's not astoundingly hard to write a solver (although it's more tricky than say Sudoku), but writing one that works like a human would is much more interesting (that's a euphemism for challenging!). I'm never just interested in whether a puzzle has a single solution (although if it doesn't then it is useless) - I want to know that it is fair to solve. And, of course, that it actually has a valid solution. Anyway, with Nurikabe it turned out that my first approach didn't scale well to larger grids so I had to rewrite a good chunk of it to 'remember' what it was doing, and then it turned out that this was still a bit slow so I had to rewrite a chunk of that new chunk too. Thus it took a while to complete! I can still think of two solving strategies I haven't implemented, but other than that I think it can solve pretty much what I can personally solve. It only really gets stuck with enormous regions right next to each other where which region joins to which area can only be decided right at the conclusion of the puzzle, and frankly I find those pretty challenging myself! I've been testing my personal solving speed on the Nurikabe samples on Nikoli's site, and found I beat the example time in all the cases so was quite pleased with that. I think Nurikabe, like quite a few logic puzzles, is one of those where you get massively faster with a bit of practice. The upshot of all this waffle is that I am planning to add Nurikabe to puzzlemix.com sometime in the next few months. I'd say much sooner but I have a lot of travelling planned, so am not sure how much time I will have. I'll also be adding Hitori for sure at the same time (I already have a huge stack of Hitori puzzles and the core players will be very similar). All of which reminds me that I really should get round to adding jigsaw and toroidal sudoku, which are already supported by the players. I also want to add in killer sudoku but I need to come up with a sane way of showing all the pencilmarks alongside the clues first! I have to say you ARE dedicated to the puzzling cause! Looking forward to new varieties of puzzles on your puzzlemix site in due course! Thanks! You encouraged me sufficiently that last night I spent a surprisingly-quick half an hour adding in the missing display code to make the puzzlemix player render Jigsaw Sudoku too, and I now have it working perfectly here on my machine. I just need to populate the puzzlemix database with some jigsaw puzzles and then it will all be away. 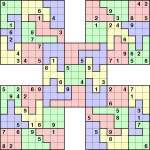 After the other day's Slitherlink I thought why not have another non-Sudoku puzzle, so here's an 8x8 Hitori. I made this ages ago and I rated it 'level2' in some long-forgotten rating scheme so I forget if it was particularly tricky or not - I expect it's not that hard at all. It might even be a bit boring... but I'll print it out later and give it a go! The rules are simple - shade in squares so that there is no more than one of any number in a row or column. Shaded squares can't touch horizontally or vertically, and all the unshaded squares must form one single continuous area (i.e. you can travel from any unshaded square to any other unshaded square purely by moving horizontally or vertically between touching squares). Unlike a lot of the sudoku variations, I personally find that Hitori is one of those puzzles I actually need an answer to, to see whether I've got it right or not! Usually when I think I'm done and look at the answer I have a couple of numbers out of place, although to be honest it's not one of my favourites, so I probably don't give it the attention it deserves! Can't wait to get stuck in to all your newly posted puzzles above! Thank you! You ARE being generous! Anyway, I've posted the solution in the post above dated 31st May 07. I don't think I've posted a Slitherlink here before, and whilst it's not in any sense a Sudoku puzzle I thought it might be quite fun to do so! This isn't especially hard, although of course if you've never solved one before you might find it so! The aim is to draw a single loop by joining the dots using only horizontal and vertical lines. The line cannot cross or in any way touch itself, and it must have as many adjacent segments to each number as specified by that number, so a '0' has no line segments next to it and a '3' must have three line segments next to it. It's not necessary for the loop to visit every dot. Managed that after a bit of a struggle in the bottom right hand corner! I don't know how anyone manages to do the giant ones you sometimes see! I can never do the big one at the back of the Sudoku Pro magazine! The giant ones are certainly intimidating! I did one a few weeks ago and it does tend to involve a fair bit of tracing lines and making little marks on them to show which bits connect where! I used to wonder who did them too, but they keep them in [Puzzler's] Sudoku magazine so someone must - the one in Sudoku Pro is to make sure there's at least one puzzle that everyone finds tricky! (16x16 and 25x25 Sudoku apart which are too big for me!). Maybe that giant puzzle won't last if people don't like it though. Very pleasant little puzzles. I actually found these quite easy, although I must admit I do spend a couple of minutes before I start shading in the regions with coloured pencil crayons to stop me getting them muddled up! Makes life much simpler. It seems there is quite a step up in difficulty from the 7 x 7 grids to the 9 x 9s some of which I can do, and some I can't! Here's something that's different, and also something I promised a little while ago. 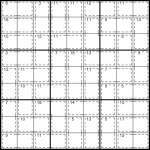 Two 5x5 Toroidal Sudoku - the aim is to place 1 to 5 into each row,column and wrap-around bold-lined region. The regions wrap around the edges of the puzzle, so where they go off one side of the puzzle they continue directly opposite. It takes a bit of thinking about but it's satisfying when you get there! 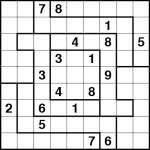 I'm off again for a few days (up to the Hunter Valley/Port Stephens region of New South Wales) but when I get back I'll post some 7x7 Toroidal Sudoku. In the meantime the 5x5 will be good practice for that, or even the 9x9 I posted previously! Okay, so I can't find the colour toroidal I thought I once posted - I'll make up for that soon(ish). In the meantime, if you ever read BBC MindGames then you'll know what I was referring to since there were definitely some in there! I managed to do your toroidal 5 x 5s without any problem. I have completed the second one of the 9 x 9s above. Really enjoyed that one. The first one I have come to a standstill with at the moment? Has anyone else out there got it finished yet? 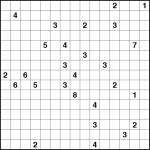 The aim of these puzzles is to fit 1 to 9 into each row, column, 3x3 and both marked diagonals, whilst placing numbers so that each dashed-line shape contains numbers that add up to the total given at the top-left of it. You also cannot repeat a number within a dashed-line shape. 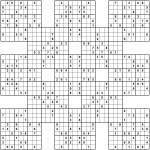 I promised to post some puzzles ASAP and then failed to do so, so to make up for it here are not 1, not 2, but 3 2-grid Samurai puzzles to get your teeth into. The aim is to fit 1 to 9 into each of the rows, columns and 3x3 boxes in the two overlapping grids. You will need to solve both grids together in order to complete the puzzle. I've just got back from Tasmania, so over the next couple of days I will be posting some new puzzles at last! Sudoku Pro 19 just went off to the publishers and this month's master class puzzle is Toroidal Sudoku - there are 4x4, 5x5, 7x7 and 9x9 puzzles to provide some variety and a gentle difficulty curve up to the 9x9. I might post some variant size Toroidal here at some point too. Whilst away I wrote pagination code for puzzlemix.com so if your list of subscribed puzzles has got long and is taking a while to reload then that will be sorted out when I get a chance to upload it to the live site. Hope you had a successful trip. Will look forward to the toroidal puzzles. Good to have a sneak preview of what is to appear in Sudoku Pro! Really enjoyed having a go at the yajilin puzzles albeit with limited success!! It would be nice to have a go at a few more of the easy ones to get a bit more used to the rules, if ever you feel the urge to produce some more!! I had a great trip thanks very much! The toroidal puzzles are fun - once the magazine's out I'll definitely post some variant size toroidals here too. Perhaps the Yajilin were too tricky - ironically it's more effort to make harder puzzles and relatively easier to make easier ones. Actually, the real sticking point is often that you create some nice tricky logic for what you hope will be a great puzzle but then it doesn't quite work out and you end up altering it to make it work in such a way that the whole puzzle becomes much easier in the process - I'm talking in general here, not about Yajilin in particular. So anyway, I'll try to put a couple of easy Yajilin up here at some point then. But persevere - I love these puzzles and as you get used to them they do get easier. You start to notice things that are always true, such as for example the squares immediately next to the corners can never be shaded, else the loop would have to enter the actual corner square and could never get out. You can apply similar logic next to various of the clue numbers sometimes too, and parts of the loop you've already placed. I will persevere with the yajilin, and thanks for the few extra tips. I did cover up the answer to the sample puzzle and managed to solve that one. I spent quite some time on the white belt puzzle and kept feeling I was almost there, but never quite made it. In the end I gave in and looked at the answer and think there was a small mistake. On row 8, column 6 it says only 2 shaded squares remain in that column but in the answer there are 3 squares shaded. I haven't completed the harder two yet, so a couple of easier ones to practise on at some point would be great. Hmm - you're right about the puzzle! I checked those exactly 5 times each (twice on paper, once on screen, and then twice when printed out in print-ready format) and somehow missed it. I can only assume I didn't use that clue when solving it and only counted the 2 filled squares before the 1-up clue above it when checking by counting. Sorry about that! Must be toroidal next month in Sudoku Pro, as we have Hashi this month. Now that I find it a little easier to get to grips with! I did suggest to the editor that some of these new puzzles feature again in future magazines as we seem to be seeing them once and then no more. Maybe you know a little more about their intentions? How about a holiday special with a bit of everything in!! I think it was felt that having too many different non-Sudoku puzzles in the magazine was off-putting to some, and that there needed to be more Sudoku-based puzzles. I think that in general that's probably the right way to go because if you look at the magazine stands there seems to be the market for plenty of boring vanilla Sudoku magazines, so hopefully this focus on Sudoku variants will keep it selling - unfortunately newsagents seem to think that people are only interested in Sudoku! (And perhaps they're right in terms of the mass market, too). Most of the featured puzzles will at some point return in a future issue as the featured puzzle again, but more generally the publishers are definitely interested in all feedback and do pay a lot of attention to what people have to say. Just a quick note to apologise for the lack of recent puzzles - I'm currently away visiting Melbourne and Adelaide, although today I'm off to Kangaroo Island (which is the third largest island off the coast of Australia - it's an hour or so south of Adelaide in South Australia) for a few days. More puzzles in about a week, hopefully! Maybe this will work better than yesterday's 4-grid version, which didn't have enough overlap between the grids to make it interesting. 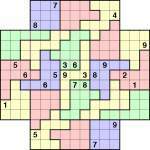 In this version you need to solve two 9x9 puzzles that are adjacent but do not overlap. However some of the jigsaw regions do overlap. The aim is to fit 1 to 9 into each of the rows and columns of the two grids (marked by the purple line in the centre), whilst also fitting 1 to 9 into each of the jigsaw (coloured) regions. Interesting certainly! I loved this one. I'm not prepared to admit how long it took me to do it, but it was very satisfying when I finally got to the end, as I do find the jigsaws difficult! I had an evil idea first thing this morning. 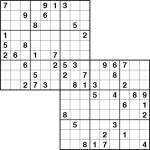 What if you placed Sudoku puzzles next to each other but didn't make them overlap? Not very exciting in itself, but what if you then placed jigsaw regions so that they overlapped between the puzzles to link them all together? Well, this is the first result. The overlap is very small indeed - just two squares overlapping between each of the regions, but it's enough to make the puzzles dependent on one another! Ideally I'd like to overlap them more but this is what I managed in the amount of time I allotted this morning to give it a go. In case it isn't clear, there are 4 9x9 grids all next to each other but not overlapping. Only the jigsaw regions overlap. The purple lines show where the 9x9 grid boundaries go, where appropriate. Not sure what the earlier comment from Yasmin refers to. This doesn't mean that it "doesn't work" per se, however the top left puzzle can be solved independently of the overlap (didn't check the other grids, may be those do require use of the overlap to solve)!!! I'll make a puzzle with 2 grids next to each other to see if I can get the principle working. Wish I could solve the grids independently Dan!! I'd better go back and have another look.I don't seem to be able to get to grips with the samurai jigsaws for some reason. Must be doing something wrong. I've had three separate attempts at this one and each time I end up with two many 1s and 4s in the bottom third of the top right sudoku grid (if that makes sense!). Is there anything different I should be doing with these sorts of puzzles? Not to be put off, I'll have a try at the two grid one next! It's finally ready! www.puzzlemix.com now has a fully-functioning online puzzle subscription system where you can sign up for free and get (currently) a new Sudoku, Sudoku X, Futoshiki and Kakuro puzzle every week. I've filled the database up with a year's worth of puzzles to start the site off. You will also be able to sign up for a further puzzle subscription to daily puzzles for a small fee (although this isn't actually active right now because I haven't added any of these to the database yet). You solve the puzzles online using my advanced in-browser players which don't require Flash or any further downloads to work. Not only this, however, but you can also rate each puzzle and view the ratings assigned by other users, or flip over to the rankings page to see full details on average, best and worst solving times. In addition each puzzle has its own comments page where you can discuss the puzzle with other users. I'm also planning to add a more general discussion area in the future. The puzzles vary in difficulty and, in the case of Futoshiki and Kakuro, size, although I'm hoping to add other Sudoku sizes in future too. I'm really keen to hear of any thoughts or suggestions (or problems, although I hope it is all working perfectly!). Is the number of weekly puzzles about right? They expire after two weeks but if you play the puzzle in that period then it stays in your account forever. The reason they expire unless played is because otherwise you could sign up one day and then come back a while later to a very large amount of free puzzles. Is a daily subscription of interest? What puzzles would you like to see? My sudoku player can handle any shaped regions (so it can do jigsaw, toroidal, etc) and arbitrary summation regions (so it can do killer sudoku along with all the kakuro solving tools once I work out how best to display the regions and totals! ), so it is in principle possible to add most of the variations you see on this site. But large puzzles won't fit in the window so well! Needless to say I've signed up to your puzzlemix site and am enjoying the free puzzles! It's nice to have some of the smaller ones to go at, although I do enjoy the challenge of the bigger ones on this killer site. Could I put in a request for a toroidal sudoku at some point please! More news soon on puzzlemix.com too, I hope - I have a fully-working version here with puzzle subscriptions, comments, ratings, publication and expiry dates and the whole kaboodle. I'm just busy right this very moment filling it with enough free puzzles to last a year, so hopefully it should go properly live soon. Okay, well this one looks positively tame after the previous circle of grids, but hopefully this will be a little easier. It's all about lulling you into a false sense of security (or something like that...). Fit 1 to 6 into each of the rows, columns and 2x3 boxes in each of the 4 grids in this plus shape. The centre is deliberately empty - there's no 5th grid lurking there to be discovered. The only confusing aspect is the overlap between the puzzles, which is two-thirds of several of the 2x3 boxes. I'm not sure about positively tame! It took me just short of an hour to get to the final few cells, only to find that as I speeded up towards the end I made a careless mistake and couldn't find out where I'd gone wrong! Back to the drawing board! Was much quicker the second attempt, as obviously I did most of the thinking first time round. Really enjoyed that one. Well I've had time to try this from scratch now, and it took me 21 minutes and it was certainly tougher than I had expected! The odd overlaps are a bit confusing so I probably spent a few minutes missing fairly obvious things as a result. I think the circle of grids really helps make the puzzle interesting because you don't know which direction the next helpful number is going to come from! Anyway, I found this was just on the right side of what I could keep track of in terms of the strange region overlaps. I can see that doing this with 3x3 squares would be a bit much probably. A pleasant puzzle, tackled over the weekend. It took me about much the same time as the Circle - over an hour! Any hints or tips, Gareth, to get that time down a bit? I need to revise the way I think these puzzles through!!! Hints and tips? 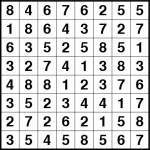 Well, the way I solve Sudoku is to scan first for single rows or columns within a 3x3 or 2x3 or whatever box that must contain a particular number based on the rest of the puzzle. Then if I find a number that must go in a pair of adjacent squares then I write that number in solidly across the grid line between those two squares; if it can go in more than two adjacent squares then I write it in solidly in all three (or whatever) squares. Any other pencil marks I place I write much more lightly, so this way whenever I scan the grid I can then see these 'bold' and cross-line pencilmarks really easily and use them to infer more digits, or more often more bold pencilmarks. So once I've inferred there must be, say, a 7 in a particular box on the 2nd row then this is really obvious at a glance so I can reason about where 7 must go in the other boxes. That way I don't "forget" what I've already worked out. The other big advantage is that if you do this you often end up with 'chains', where placing a number gives a lot of 'therefore this must go there' type observations from these bold pencil marks that don't require you to think or check off anything. Finally, when solving the odd-overlap areas I drew feint lines between numbers to show which region I had worked out they must fit in, because of course there are some cells where with the technique I described it would be ambiguous which of the boxes they referred to. I don't normally do this for rows or columns (just for boxes) because these tend to be much easier to spot at a glance anyway, and once you do that it gets confusing. Of course, the technique breaks down a little for extra regions or Sudoku X etc because then I need extra markings to show which regions my markings apply to. Maybe that's why I find myself very slow at solving Sudoku X puzzles! Anyway, I never write in 'all the pencilmarks' unless I am completely and utterly stuck, because I find this generally just obscures things. And when I do I sometimes rub them out again once I've 'unstuck', because they make it harder to spot the patterns my bold pencilmarks are designed to highlight. It's generally best to write as few pencilmarks as possible, which is why I stick to purely writing across the line joining two cells if I can. Oh, and one final tactic for Samurai - obviously I aim to solve the areas that overlap the most as soon as possible, and I work out which numbers must be propagated into an area to progress and try and solve those first. E.g. if I need a 4 somewhere to get on then I look at solving the 4 in adjacent grids. 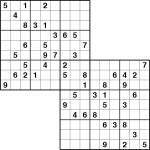 If you've seen a Samurai Sudoku like this before then I'll eat my metaphorical hat! I've just been fiddling about with different grid layouts on paper and thought I'd try out a circle of 6x6 grids (on the basis that probably noone would have the patience to solve a circle of 9x9 grids, although I could be wrong on that!). I've also got a semi-circular version too that I haven't posted yet. 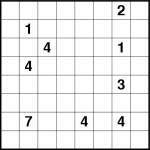 If you'd like me to try out any other new Samurai variants then just send me a list of coordinates for the top-left corner in cell offsets (eg a 2-grid 9x9 samurai has grid 1 at 0,0 and grid 2 at 6,6). Anyway, let me know how you get on! Okay, well it took me about 40 minutes to solve, so so much for 15 minutes! Glad you mentioned the 40 minutes! Makes my time of just under an hour more respectable! A very enjoyable puzzle. We'll await the semi-circular one now! Another lovely puzzle, Gareth. True to form, this took me 1 hour and 15 minutes! I got quite stuck on the three grids on the right but never mind - looking forward to the semi-circular puzzle. Now here's a puzzle I haven't made before, which is actually based on two recent suggestions for more killer sudoku and more extra regions sudoku. I thought I'd combine the two, and so this is the result! You can probably deduce the rules for yourself, but just in case: place 1 to 9 into each row, column, 3x3 bold-edged box and 3x3 pale red box. You must place numbers so that each of the dashed-line cages adds up to the total at the top-left corner of it, and you may not repeat a number within a dashed-line cage (this is a really important rule!). As I'm sure you're starting to notice Gareth, I don't take long to have a go at your new puzzles, do I?! I love all the variations you keep coming up with! This was a nice little puzzle, I started solving it as a normal killer and as I went on, found the pale red bits gave extra clues and made it a bit easier to solve! I like the new Sudoku Pro by the way, especially the samurai star and basically all the variety in the mag. Some of those killers are DIFFICULT! Thanks Christine! Yes, some of the killers in Sudoku Pro can be tough. The ones on pages 5 and 17 are supposed to be easier and the ones on pages 23 and 36 tougher. (You definitely don't need the 45-rule for the first two and you only need to consider what numbers can fit in a cage, not where they might fit too.) It's complex to rate them because (of course) the Sudoku aspect too, which obviously can be easy or hard as you start to fill in numbers from the killer cages; I work on the basis that the Killer part is key to rating it, but even then there is a lot of subtlety that can be applied; for example it's obviously easier to work out what can fit in a 3 cage with 2 cells than a 8 cage with 3 cells, even though if you make pencilmarks both may be equally 'easy' in terms of the logic. I also score puzzles that need you to observe that you can add up one or more standard Sudoku regions and observe they sum to multiples of 45 as harder, even though in some puzzles due to the shape layout this can be moderately obvious. Also it's usually the case that fewer and bigger cages = harder, and smaller and more cages = easier, but that's in terms of coping with the information (the size of the search space once you have a candidate list for each cell/region) as opposed to the actual complexity of the logic you need to solve it. So it's a fine balancing act and it's tough to get it right. I'd be interested to know which puzzles you find particularly easy or hard and I can have a look at my notes on them and see how this fits in with what I expected. Finally, if you like Sudoku Pro then please do email them and say - it makes a huge difference. In particular if there are any puzzles you like then do let them know because the contents will be revised from issue to issue based on customer feedback (so the next issue is going to have more 16x16 puzzles in for example because the previous version of Sudoku Pro had them in and so people have asked for them). At first glance it scared me, as I'm not too hot with killers. However, the extra regions helped make the killer part easier to solve, as Christine has said. It was a delight - thank you!! I am also enjoying Sudoku Pro and will be emailing them accordingly. I'm rather hoping that the Star and Extra Regions puzzles can become regular features, but overall it's a very nice magazine. Well Gareth, you spurred me on to get all the killer puzzles in the Sudoku Pro mag finished! Like you said the ones on pages 5 and 17 were fairly straight forward and didn't cause too much difficulty. The one on page 36 I found much more difficult. I'm not an expert by any means so I would say it took me just over an hour, and never mind the 45 rule, I only got into it by the 135 rule (maybe I've made that one up - noticing that over three 3 x 3 grids just one cell was sticking out!). I really enjoyed that one. The one I found the most difficult was the one on page 23. After half an hour I only had 2 cells filled in for definite and couldn't seem to find a way in. If it hadn't been for the fact that I was determined to report back I might have given in, but then suddenly one or two numbers clicked into place and after quite a bit of sorting out I finally completed it. I think it's great to have puzzles of varying difficulty to suit different moods. I also enjoyed the killer X and jigsaw killers. These make you think but are not quite so difficult as the tough killers because the extra dimensions give away a few more clues. Now all I have to do is somehow work out how to solve one of your samurai jigsaws! I haven't managed to do a single one yet! I have e-mailed Sudoku Pro as you suggested. I said my favourites were the Killer sudokus, the star sudoku, the futoshiki, hitori and (for your benefit Pickle! 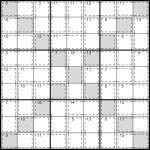 ), the extra regions sudoku! Interestingly enough I would never choose the 16 x 16 and 25 x 25 sudokus as they are more of a chore than a pleasure, but if that's what other people are requesting then who am I to argue. We don't want any more magazines to cease publication due to lack of interest! Thanks very much for writing in to the publishers - hopefully this will help keep your favourite puzzles in the magazine! Thanks also, Christine, for the feedback on the killer sudoku difficulty - I'm glad to hear you found the first two were easier. The rest are no-holds barred, because you are completely correct in saying that you need to sum multiple 45 areas. Actually, in my killer puzzles you sometimes need to sum multiple rows or columns or 3x3 squares into a region and look for a single unknown square that sticks in or out. However once you've solved some squares these can be used in making 45-minus-all-solved-squares regions which can be summed together in the same way. This is all pretty complex and I decided not to go beyond this and ever require arbitrary arrangements of puzzle regions of different types, but of course sometimes these can be useful when solving even if they're not strictly essential. Talking of difficulty, in future the puzzles in Sudoku Pro might be explicitly marked with difficulty levels, but I'm not sure whether this will actually happen or not. As I've already said they do get harder as the magazine progresses anyway. The issue that went to press last week has Yajilin puzzles in, so it should be interesting to see if there's any feedback on that! The layout works in Firefox now (I'd accidentally left a height setting in which Internet Explorer was ignoring but Firefox was honouring), and the RSS feed now contains the puzzles as well as just the descriptions! It also has the paragraph structure back, where present. I've also made the previous RSS feed location work too so you shouldn't have to re-subscribe. Plus I've fixed some of the existing comments which I'd attached to the wrong posts by mistake when re-creating the existing content. The edit comment dialogue now also returns you to where you were, and when you add an account it now sends you a copy of your username and password (plus a 'forgotten password' page has been added too). Hopefully that's everything sorted now! 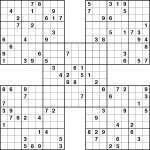 Okay, so it's not the most exciting variation in the world but I do think they're quite fun - so here's another 5-grid Samurai Sudoku. As ever, fit 1 to 9 into each row and column and 3x3 square of each of the 5 overlapping grids! I'll work on some different variations for coming posts, but this is just to christen the new web system! 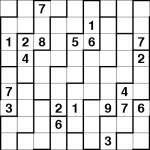 It's a while since I had a go at a standard samurai sudoku so I really enjoyed having a go at this one. It took me quite a while chipping away at it, until you finally reach that point where everything falls into place. Very satisfying! If you had a user account before it will now have vanished so you will need to create a new one, but this is very very easy and then you'll never have to fill in any details again to post comments - also you'll be able to edit (and delete) your own comments if you want. Here's what the killer sudoku blog used to look like. I've re-implemented the RSS subscription feed so there's a chance it might not work in every RSS reader, but it works properly in Internet Explorer and Firefox. If you spot any problems then let me know, otherwise it's back to the puzzles now! Following the success of the previous 5-extra-regions Sudoku puzzle, here's another to keep you going! 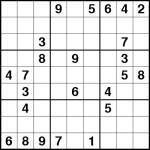 The standard Sudoku rules apply, with the extra rule that each of the 5 pale red areas must also contain 1 to 9. Another lovely little puzzle. A little more difficult than the last, but after a slow start a couple of numbers suddenly became obvious, and then others seemed to slot into place! Took 20 minutes this time. Very pleased to see an extra regions puzzle in the new Sudoku Pro magazine! Delighted to see a samurai Star, as well! 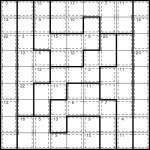 Here's a standard 5-grid Samurai puzzle. 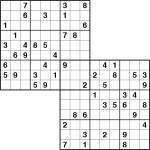 (The aim is to solve each of the 5 overlapping Sudoku grids simultaneously). At last, one of your puzzles I could do without any difficulty! I enjoyed this one. I timed myself and managed it in 10 minutes which I didn't think was too bad! Glad you enjoyed it! I've just posted another one using the same extra region pattern, so see if you can do this one as fast. I'm impressed with 10 minutes! I love extra region puzzles. It was a pleasure to have a nice, easy puzzle to solve and I'm looking forward to having a go at the new one tonight. Well done on that time, Christine - it was 20 minutes for me!! Here's a larger-than-average jigsaw puzzle. Can you place 1 to 9 and A to C into each row,column and marked shape in this puzzle? The colours are just for decoration, but they do make it easier to see at a glance where each shape is. Good luck! Now this is the sort of puzzle I really love! I didn't time this one, as I knew I wouldn't want to admit to the time it took me, but I found it very absorbing. Difficult enough to get those little grey cells working, but I got there in the end! I do find having the colours is helpful. I miss this type of puzzle now that BBC MindGames has ceased publication, so thanks very much for continuing to post puzzles. Much appreciated. Fantastic. Thanks for this one. It absorbed me completely for quite a few sittings. Managed it eventually, but felt mentally drained. Thanks again! Just for a change, here's a Kakuro puzzle. The rules are simple: Fill each white square with a number in the range 1 to 9 so that each consecutive run of white squares adds up to the number at the top or left of the run. The key to the puzzle is that no number can be repeated within a run. This one is causing me some grief! Maybe I'm missing something obvious, but I've had three goes at this and cannot get it finished. One last go before I give in! Posted 21/02/2007 by Gareth Moore at 10:29Giant 8-grid Samurai Jigsaw! Now here's a challenge for any Sudoku masochists out there! It's 8 overlapping 9x9 grids with a symmetric Jigsaw pattern that wanders right across them all. 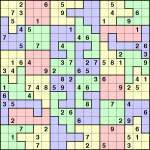 You must fit 1 to 9 into each row and column of each 9x9 grid, as well as 1 to 9 into each coloured jigsaw shape. Good luck! You really will need it for this one!!! I'm still away but here's a puzzle to keep you going. It's a 5-grid samurai jigsaw puzzle. You need to solve all 5 grids simultaneously to solve it - the purple lines clarify where the 9x9 grids overlap (this helps because the jigsaw shapes cross over between grids). Thanks for the jigsaw samurai Gareth. Hope you're enjoying your travels. It is my puzzling ambition to crack one of these samurais in the end! I haven't managed any of the ones in MindGames yet, nor this one, but I keep going back to them all, and managing to find another number or two, so I'm hoping eventually perseverance might pay off! I wouldn't like to have to admit that I'm just not able to do them!!! If you're using Internet Explorer 7 then you should notice the orange 'RSS' icon at the top-right of the browser window light up on this site (just under the search bar). By clicking on it you can 'subscribe' to this site and keep track of when new puzzles and posts appear without having to check the site directly. It will appear in the 'Feeds' tab that you can choose when you click on the 'Favorites Center' Star icon at the top-left of the window. Other browsers and RSS feed readers are also capable of doing this too. Here's an interesting puzzle, requested by 'Pickle' over on the BBC MindGames magazine forum. 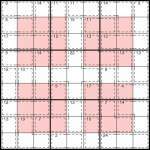 It's a 13-grid Samurai puzzle, and you must solve all 13 grids simultaneously! A very enjoyable puzzle. Extremely pleased that it could be solved simply with logic and (for me) locked candidates. Having said that, anyone employing those weirdly named advanced Sudoku techniques could probably finish the puzzle within a "respectable" time, so my time of 12 and a half hours should not be taken as gospel!! More insanely large puzzles, please!!! I'll buy the E-book!! I'm currently having a go at that 8-grid samurai jigsaw. I don't know why, because I can't do the 5-grid ones!! I guess I'm just a gluton for punishment. Speaking of which... have you ever given any thought to a hybrid samurai? Again, thank you, Gareth, for taking the time in putting these puzzles up for our continued enjoyment. I'm currently away from regular internet access whilst I'm travelling so apologies for the lack of new puzzles for the past couple of days. Hopefully I'll manage to get a couple new puzzles up in the next day or so, but no guarantees! If there's any particular types you'd like to see then do please let me know and then I'll focus on those. I'm assuming that unusual types are of the most interest but perhaps it's more basic variants that you'd prefer to see? Let me know! 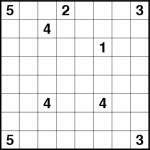 Any sudoku variants you would care to post would be gratefully received! A particular favourite of mine at the moment are the toroidal sudokus, so one or two of those would be lovely. Thanks! The site is called 'Killer Sudoku' so maybe it's time for an actual Killer Sudoku puzzle... so here's a jigsaw one! Can you fit 1-9 into each shape, row and column whilst obeying the region totals? No number may be repeated within a dashed cage. It's not as hard as you might think, once you get your head round it! Here's an interesting puzzle. 5 grids overlap - can you solve them all simultaneously? Don't forget the 'hidden' one in the middle! I have had a couple of tries at this at the moment, but have to admit to having gone wrong both times. 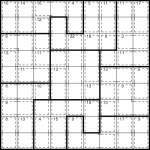 Am I right to assume that each of the five 9 x 9 grids have to contain the numbers 1 - 9 in each row and column, irrespective of whether the jigsaw pieces have crossed over these grids, because at the moment I am getting two 4s in the right hand column of the 9x9 grid at the top of the star. I hope that makes sense? 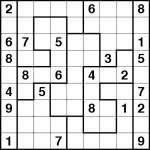 Perhaps you could explain the rules in a little more detail for the not so experienced jigsaw sudoku puzzler! Thanks a lot for your trouble to keep us in puzzles now that MindGames is going down. Let's start off with this. It's not that tricky really, once you get your head round what you need to do! Place 1-6 into each row and column of the three overlapping grids. Place 1-6 into each coloured shape. Managed to crack this one without too much difficulty. Than goodness for something after some of the other puzzles! Took me about 10 minutes, so not too bad. I thought it was about time to start posting more of my puzzles online. I've had www.dokakuro.com, www.dofutoshiki.com and www.dosudoku.com (the last a bit more basic in appearance) for a while, but all my more exotic puzzles have remained within the pages of books and magazines. Now with this site I'm going to correct that. This site's not just for Killer Sudoku, it's for Killer Sudoku - that is, awesome Sudoku! Well that's the aim, anyway. 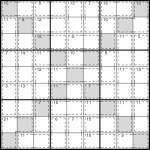 My Sudoku puzzles - and countless variants! - have appeared in a wide range of places including Total Konzai, Sudoku Pro, Total Sudoku, BBC MindGames, BBC Radio Times and countless books. See www.puzzlemix.com for some of my publications. To date, the most elaborate and colourful specimens have been seen in BBC MindGames - where else have you seen a 3-grid jigsaw 6x6 samurai stack puzzle, or a full-colour enormous samurai jigsaw? And not both in the same magazine, I'd bet. So here we are. This is an experiment but we'll see where it goes. I'll start off shortly with a big colour puzzle and we'll take it from there. Please do comment on posts and the site - I'm making this up as I go so I'll pay attention to what you say!